Hear about the Pathway to Greatness Project from Superintendent Sean McDaniel. 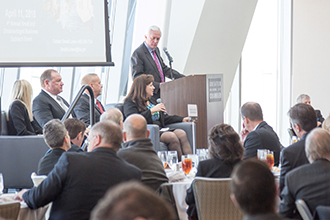 The Chamber Forum series brings thought leaders together to discuss major initiatives, programs and current issues that impact Oklahoma City's business climate, economy and community. Attend the February Chamber Forum to hear more about the Oklahoma City Public Schools' Pathway to Greatness Project from Dr. Sean McDaniel, superintendent of Oklahoma City Public Schools. The Project is the district's next step in aligning its resources to provide equitable learning opportunities for all students. District facilities are operating at about 60 percent of capacity and the district faces $11 million in reduced state funding over the next two years based on projected enrollment declines. Learn how a thorough assessment of the district's facilities, a detailed demographic study and input from staff and stakeholders is helping the district develop a plan to realign its resources and invest more in each individual student. Individual tickets are $35 for Chamber members and $55 for nonmembers. 2019 half series ticket packages are available now! Reserve your seat to five luncheons at a discounted rate of $150. For more information or to purchase individual tickets or a series ticket package, email register@okcchamber.com or call 405-297-8921. Online ticket sales are currently closed.